Accidents involving large trucks and other motor vehicles tend to be catastrophic, all too often resulting in serious injuries or death. The sheer size and weight of large trucks make them inherently more dangerous than other motor vehicles; when negligence on the part of the driver of the truck, the trucking company that owns and operates the truck, or the manufacturer of a defective part of the truck contributes to the accident, victims are entitled to compensation for their resulting losses and expenses. 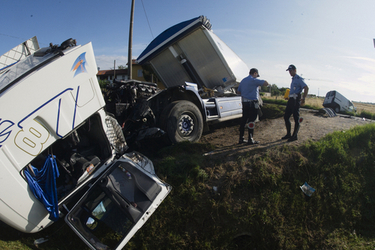 However, truck accident cases are among the most complex in personal injury law. They require meticulous investigation and the ability to pinpoint acts of negligence, sometimes on the part of multiple parties. The White Plains personal injury attorneys of the law firm of Worby Groner Edelman, LLP, have extensive experience and an impressive track record of success in handling truck accident cases, having obtained millions of dollars collectively on behalf of injured victims and their families. They know how to build the strongest cases possible on behalf of truck accident victims, proving fault through carefully collected evidence and sound legal strategies. In order to prove fault, our White Plains truck accident attorneys must work with industry experts and experienced investigators to collect important data and reconstruct the accident. We must obtain and examine the driver’s logs, documents detailing the driver’s training background, the truck’s maintenance records, documents pertaining to the safety inspections of the truck, the statements of any witnesses, and other vital pieces of evidence. Time is of the essence in collecting this evidence, as documents can be altered or lost and memories can fade as time passes. The plaintiff sustained demonstrable losses and expenses as a result of this injury. By proving fault through the establishment of these elements, our personal injury attorneys are able to obtain compensation for the victim’s losses and expenses, including medical bills, rehabilitation expenses, pain and suffering, and lost wages. In cases in which the victim or victims were tragically killed in a trucking accident, we are also often able to obtain compensation for funeral expenses, future lost wages, loss of support, loss of consortium, and other losses and expenses that can reasonably be forecast into the future. If you or a member of your family has been seriously injured, or if you have lost someone you love, due to a collision with a large truck, we urge you to contact the White Plains personal injury attorneys of Worby Groner Edelman, LLP today for an evaluation of your case.